This week at Journey I taught about Creation. It just so happened that while I was preparing my lesson, I finally opened an email that had been languishing in my inbox for several weeks. It just so happened that the email contained an illustration of God as the Potter that would fit perfectly with my lesson. Now, I do believe that some things that happen are just a coincidence, but I also believe that this many coinciding events are not coincidence but God incidents. I could see His hand as I was putting the Creation message together, but I had no idea it wouldn’t end there! 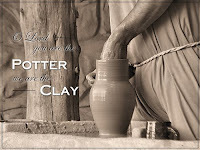 It just so happened that when I turned the car on the radio played, “Lord if I'm the clay then lay me down On your spinning wheel, Shape me into something you can fill with something real” (Caedmon's Call “Hands of the Potter”). I’d never heard this song before, and just caught the last line. Now God really had my attention, because at the end of my teaching I posed two questions to ask God that I had gleaned from the email: How would You like to shape my life? (vs. me deciding what I’d like to do) and How can I cooperate with that shaping? This was too much! I’ve seen God’s hand in things before, but I’ve never had this many promptings in such close succession. One thing God impressed upon me was that while I had posed those two questions to those attending the Bible study, I’d never posed them to God for myself. Obviously, that is something God wants me to do! There was a time when this series of events would have terrified me. I think that’s because God doesn’t usually call me to things I’m already comfortable doing, but to things that I either don’t feel qualified for or have never even considered. Plus, quite often the things God calls me to are difficult, and He doesn’t show me when or how it’s all going to end. All I get is the next step, which, in looking at Scripture, is how He generally works. Yet I came home excited! God is doing something new and He wants me to be a part of it! Something amazing and life changing! Eve Gets a Bum Rap!